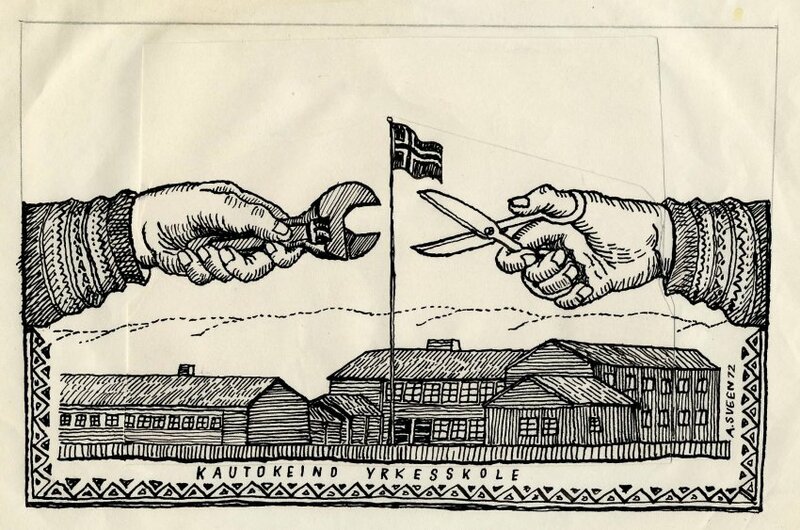 In 1952 the school named "Statens heimeyrkeskole for samer" (State handicraft school for Sami) was established. The name of the school has changed several times and is now called Sámi joatkkaskuvla ja boazodoalloskuvla / Samisk videregående skole og reindriftsskole (Sami secondary school and reindeer herding school). When I was a pupil at this school in 1974/75, it was called "Den samiske yrkes- og husflidsskole" (The sami vocational- and handicraft school). At that time the school was almost the same as any other Norwegian vocational school, with a very small amount of sami contents and language. The pupils did not know that the situation 20 years earlier had been completely different. The school was initially based on sami culture, and sami language as a subject was mandatory for everyone as well as partly being used as the language of instruction. This information and this story has come to our knowledge by searching through archives and by interviewing a few of the people who attended the school in the first years. It turns out that the 1960's were a time of great changes; sami contents and language disappeared in the education, and was replaced by national Norwegian education. "Alongside the measures mentioned by the Ministry of Education and Church Affairs, the County Council would like to suggest that aims to build a permanent handicraft school for Sami youths should be taken. This school should be placed in Kautokeino which is by far Finnmark's largest reindeer-municipality, and in the first round one should aim at professional education of Sami boys related to the work of utilising the products of the mountains (bone crafts, preparation of reindeer skin, carpentry etc.). If one looks at the development within the reindeer husbandry over the past decades it becomes clear that even though the number of reindeer has an annual growth, there is a decline in the number of people who have this occupation. On the other hand there is an increase in the number of settled Sami who are destined to a barren agriculture without market potential and a small amount of catching and fishing. One is here facing a large scale occupational problem that can, at least to a certain degree, be eliminated by a systematical development of the home-profession, based on quality and with a preservation and further development of the old Sami culture of arts and crafts. The County Council will therefore form a committee who's work it will be to continue this task and present specific suggestions for acheivement of this plan." The Norwegian schools and society were still pervaded by the process of Norwegianisation when this school was established. 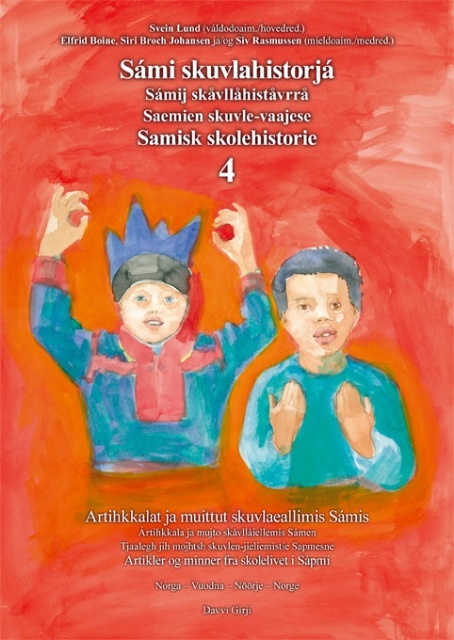 A few years earlier Samordningsnemnda (the Coordination Committee) made the humble suggestion that the politics should change in order to make room for Sami language and culture within the school. This was in no way taken into consideration, and the schools still followed the Norwegianisation instructions of 1898. Sami culture was not regarded as something worthy of preservation. 1. Create a foundation for an improvement of the economy - of both settled and nomadic Sami. 2. Revive the sense and respect for the great values within Sami culture and language. 3. Revive and make certain the sense of style and taste. Locate and instil the characteristic Sami features in cutting fashion, patterns and ornamentations. This with consideration to the fact that one can have pupils from different Sami regions with their own regional distinctive features. The courses included in the practical education are in line with these aims and illustrate that through this work, the Sami culture and Sami knowledge is viewed as the primary foundation of this school. The pupils Kristine T. Turi and Ellen Kristine A. Juuso are weaving bands for fur shoes. 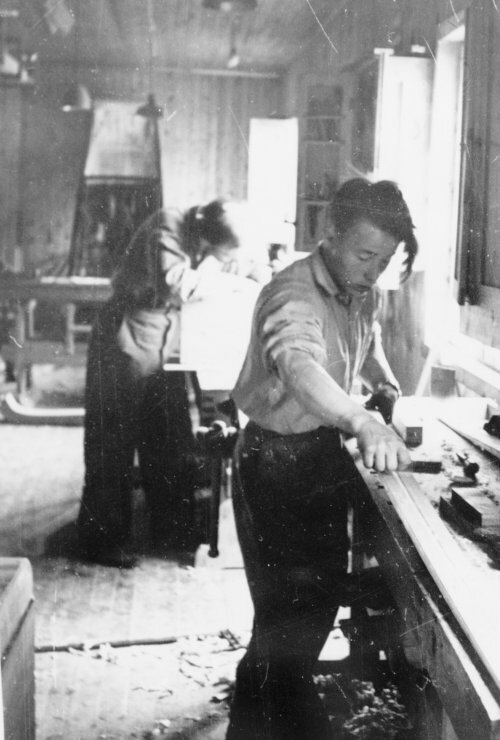 (Photo: State handicraft school for Sami / The National Archives ) From the carpentry room. In front: Johannes Keskitalo. 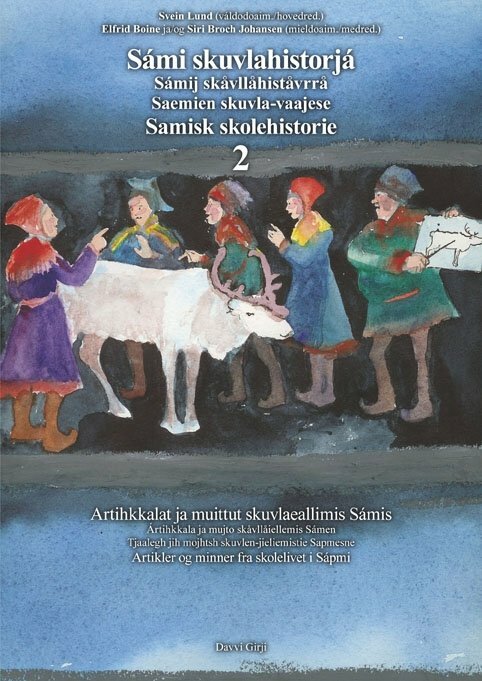 It was named Statens heimeyrkeskole for samer i Kautokeino (State handicraft school for Sami), and as the name illustrates, the aim of the teaching was first of all directed towards the practical work associated with the Sami homes. It is not our intention to provide a vocational training for crafts and industry with the result that the youths have to move to the cities to find suitable work when they graduate. The point of departure is the Sami environment and society as we know it today. The school also has a cultural programme. It will try to teach the Sami youths respect for Sami culture and Sami traditions and revive the youth's self-esteem. 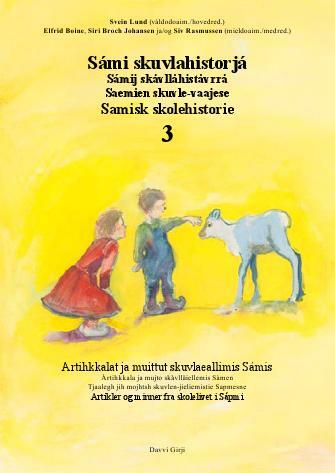 One has therefore in the programme heavily emphasised that the school should be a home to Sami and that the teachers should have close relations to the Sami society, and preferably be Sami themselves. The school can not be a true home as long as they teach in a foreign language because the teachers do not speak Sami. The language of instruction should also be Sami due to numerous other reasons - just think about all the terminology related to the reindeer husbandry. Sami as an examination subject in 1955! Sami was a subject at the school from the very begining, and it was during the first four years taught by Anders J. Bongo. In 1955 and 1956 it became an examination subject as well and Sami consultant Hans J. Henriksen was the external examiner. In 1955 the exam consisted of dictation and composition, and in 1956 of dictation and translation. In relation to the exam in 1955, Henriksen wrote a covering letter to headmaster Sigurd Skoglund in which he commented: "Bongo must have put great efforts into the Sami training, considering that what is shown is the results of barely 10 months of teaching altogether when it comes to writing and orthography." 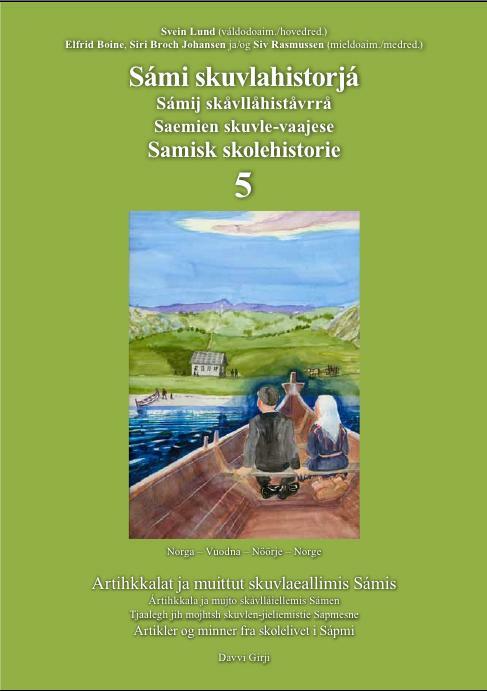 In 1955 it were in addition to a written exam also an oral exam and an exam in Sami history. It seems like Sami was to a large extent used as the language of instruction. There were at least no demands to use Norwegian when the teachers and pupils spoke Sami. On 08.04.1952 the vocational-school board proclaim: "The language of instruction should be Sami whenever possible, at least in the practical subjects." B. Iron and metal work. In relation to the practical tutoring there will be provided theoretical tutoring. There are no study fees and there will be an opportunity to apply for scholarships to cover travel and living expences. The school has dormitories on nice new premises, and there will be arranged full provisioning of the pupils. For further information please contact the school, adress: Kautokeino. Applications should be sent as soon as possible. State handicraft school for Sami was turning into a Norwegian vocational school. 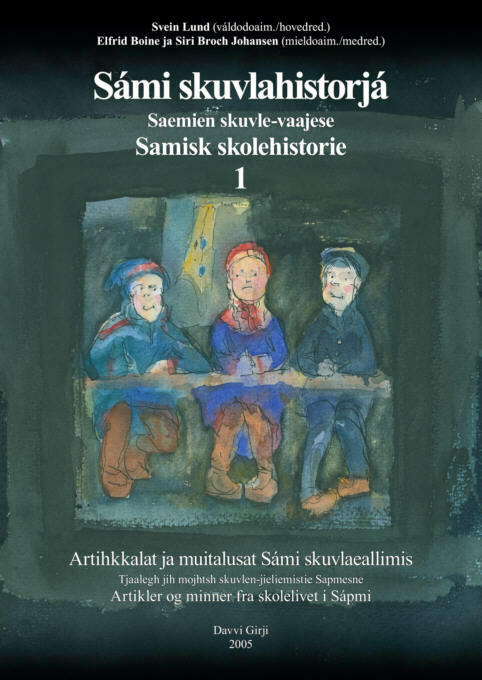 The headmaster at that time, Svein Hermann, explained and defended this change in 1971: "After the school made use of it's new buildings in 1960, and there was established three different fields of studies, there were made decreasingly less Sami utility articles at the school. 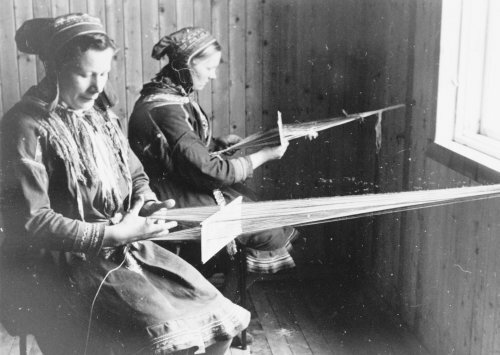 There were in particular difficult to make room for Sami handicrafts within the field of iron and metal work. The conditions in the inland of Finnmark during the 60's had changed considerably from the time when the aims of the school were defined in 1952. The school board faced the consequences of this change and in 1962 they agreed upon a revision of the curriulum where the board recommended that the education should be in accordance with the A-plan of the vocational school." In a note from Reidar Marmøy from RVO (Council of secondary education) 1978 the changes are described as the following: "The curriculum was changed in accordance with the A-plan of the vocational school during the school year 1962/63. This lead to discontinuation of characteristic Sami activities. The school became an ordinary vocantional school but Sami youths should still be prioritised for admittance."
. The Council is of the opinion that a vocational education without cultural characteristics at this school cannot be justified. Regular vocational education of Sami youths will be more efficient at other vocational schools within the County or the rest of the country. The Council will consequently request an immediate revision of the curriculum. The revision must take into consideration the specific purposes the school was intended to serve, such as they are described in the name of the school and the documents of which the establishment of the school was based upon."